Here it is. The Granddaddy. Numero uno. That which came before. The foundation that was laid and led to you reading this sentence. 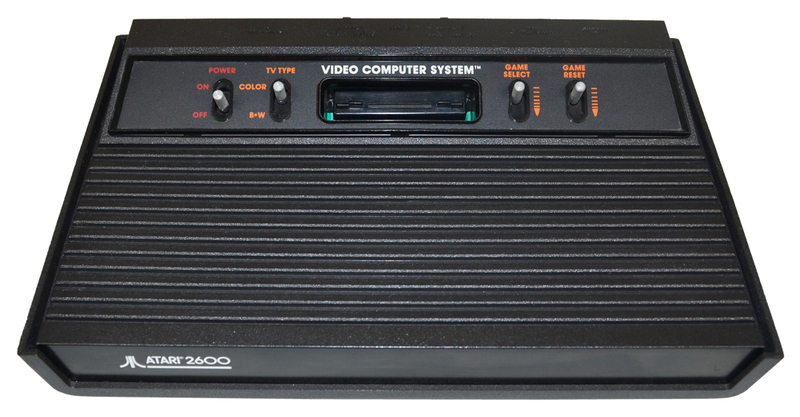 The Atari Video Computer System (VCS). Oh sure, there was Pong before the VCS (also made by Atari), and the Magnavox Odyssey, but this is THE system that REALLY started it all in 1977. The Atari ushered in the first scenes of kids and parents sitting on the living-room floor, with a pile of game cartridges, and staring at the TV for hours. The cartridge based games are what really set this system apart. Up until that time Pong and all the Pong clones, were the game. You didn’t add games to it, it came with what it came with and that was it. My dad (whom we would visit in the Summer) had the first one I ever saw at the age of 7. It was the original Heavy-Sixer that came with Combat. We also had Space Invaders and Missile Command, which I played endlessly. I would return to mom and beg for her to tell Santa to get me one. Well, Santa was broke but eventually came through big time with a ColecoVision! So the Atari was what I cut my teeth on and never looked back. It is a must have for the collector, lets find out why. Original Model – Sometimes referred to now as the “Heavy Sixer” version. 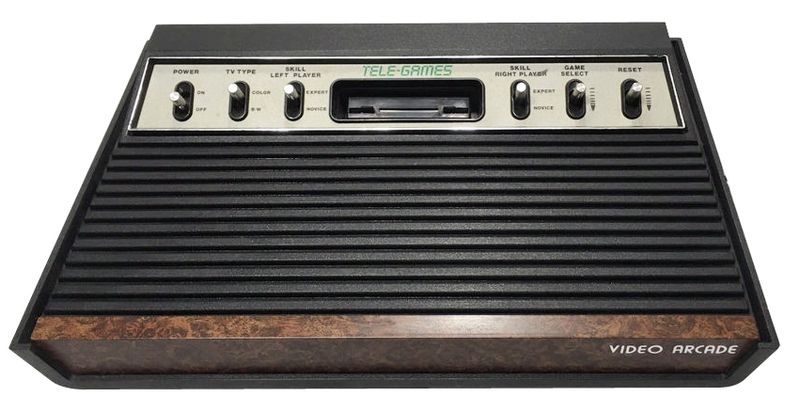 This original model was made by ATARI in Sunnyvale, California, and started out with a thick plastic “heavy” case, making it the heaviest version, of all the versions that were to follow. As for the “Sixer” part, it refers to the six aluminum switches located on the top/front of the unit, which would also change in future revisions. 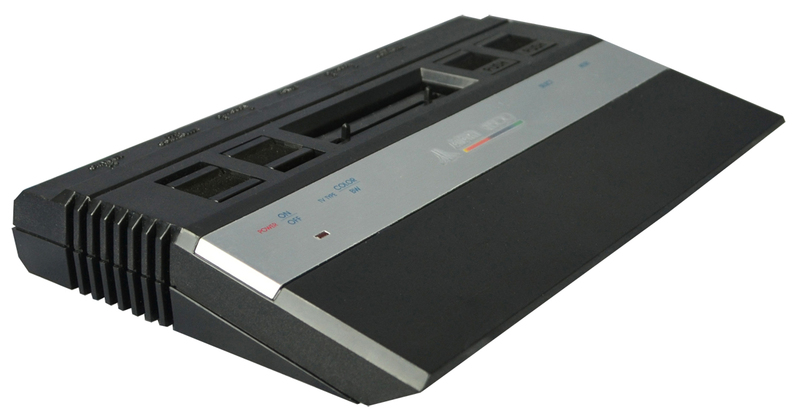 ATARI manufactured this model in California from the initial launch production for the 1977 launch through 1979 when production was moved to Asia. You can spot this model by the sticker on the bottom stating it was manufactured in Sunnyvale. The VCS was the actual acronym for the system, with the full name being ATARI Video Computer System. 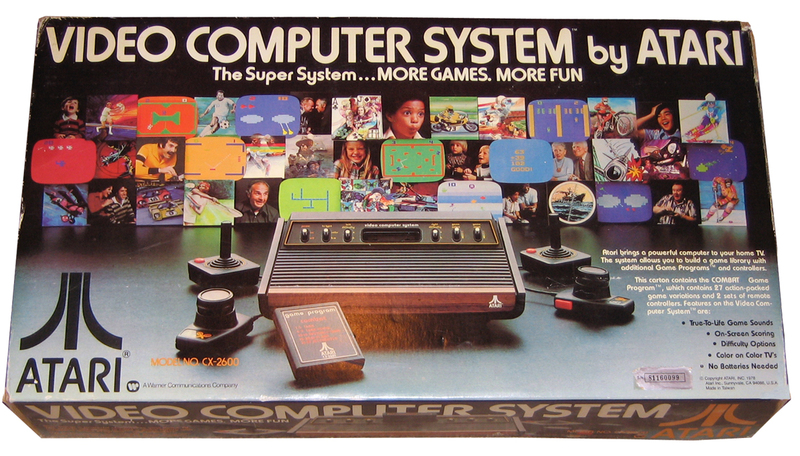 The model number for the machine was CX2600, but it wasn’t actually referred to as the Atari 2600 until the 4th revision in 1982, when Atari added it to the actual name and logo on the machine. 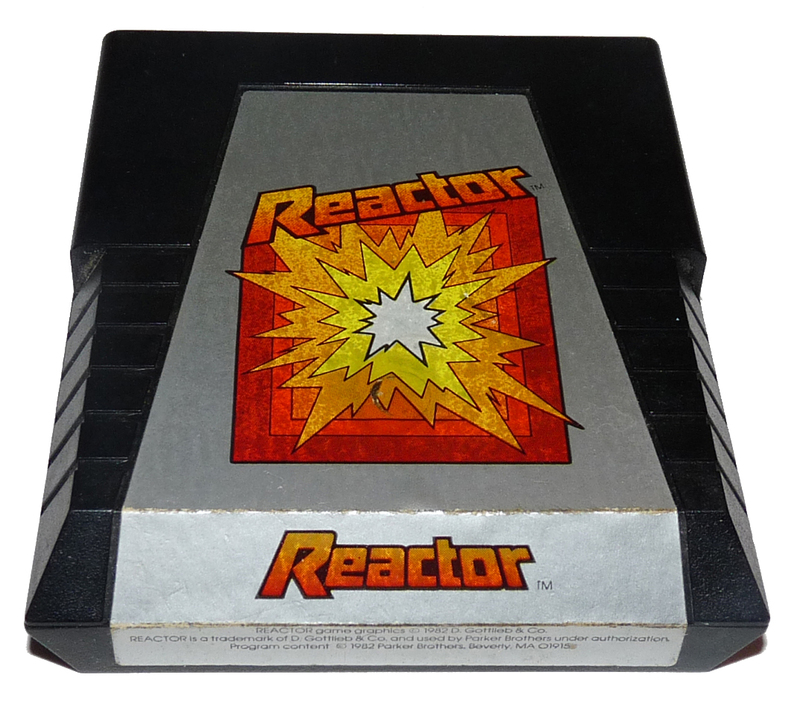 This name change was tied with the release of the Atari 5200 to provide standardized naming. 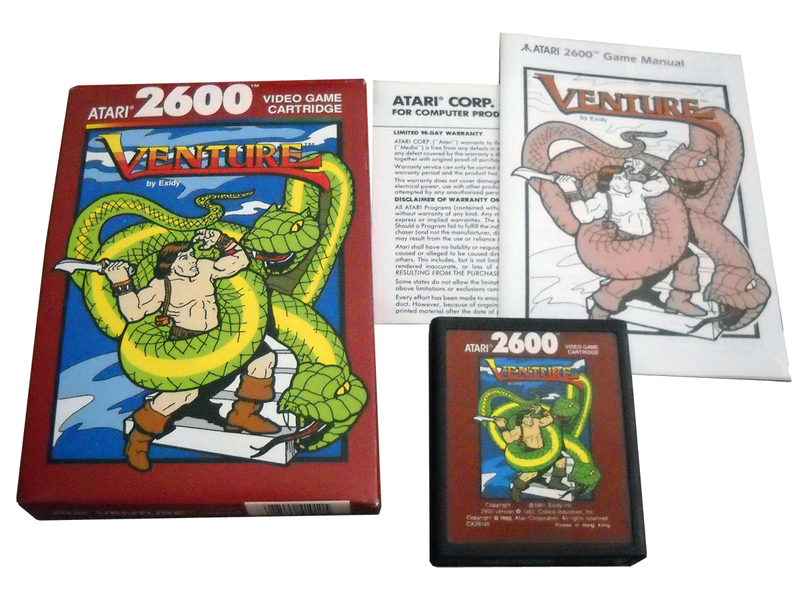 Either way, VCS and 2600 are interchangable and there is no difference. Sound: 2 channels of 1-bit monaural sound with 4-bit volume control. 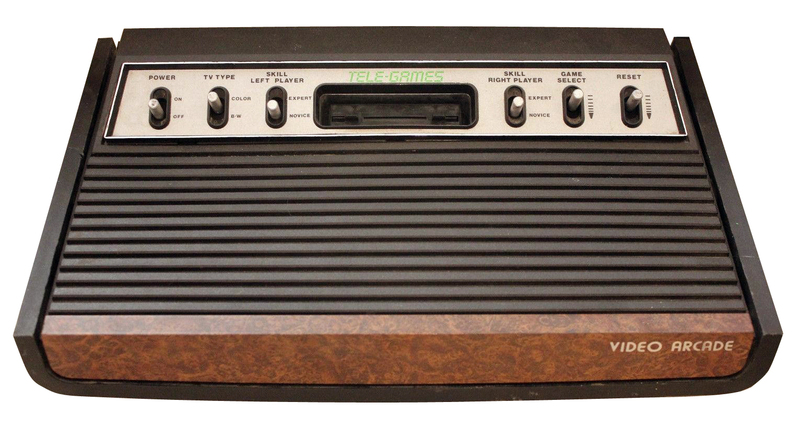 You know it’s a classic when your video game system has a wood finish. 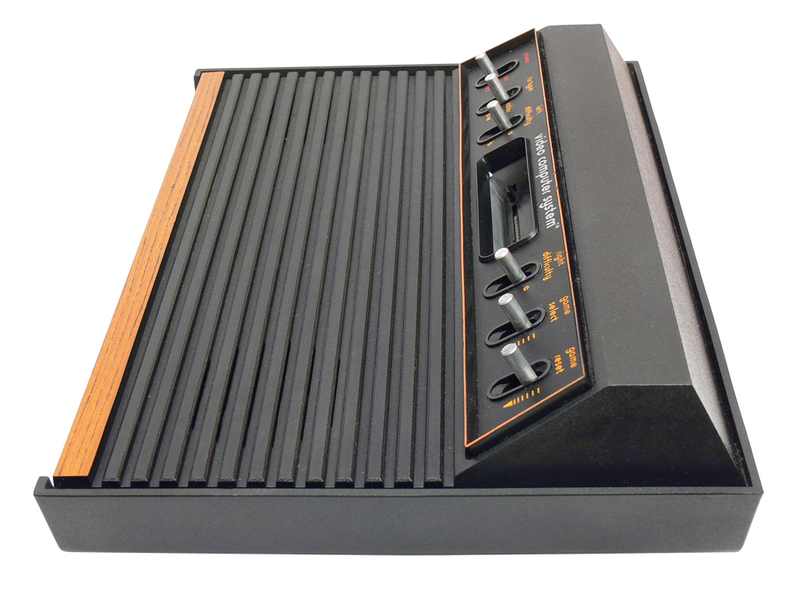 The first thing you notice when you see the early models of the Atari 2600 is the iconic wood grain veneer wrapped around the front of the machine. No, it’s not real wood, but it looks great! Front facing on the right side is a white Atari logo. There are no ports of connections on the front of the machine. 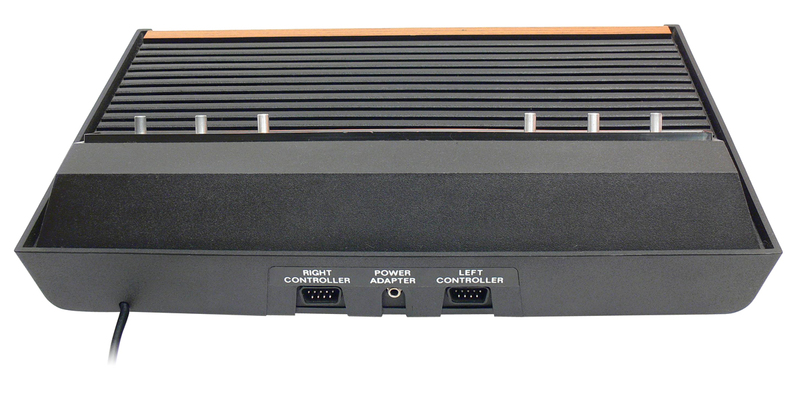 The top of the Atari VCS is dominated by a thick black grill that runs form the front of the system until it meets the control deck on the back. There are two actual vent holes in this grill on the left and right sides. It almost looks like there are speakers in there, but they are only for ventilation. The control deck for the Atari VCS is also iconic. All the controls are on an angled face with a thick raised trim edged in orange. In the middle of the deck is the cartridge port. 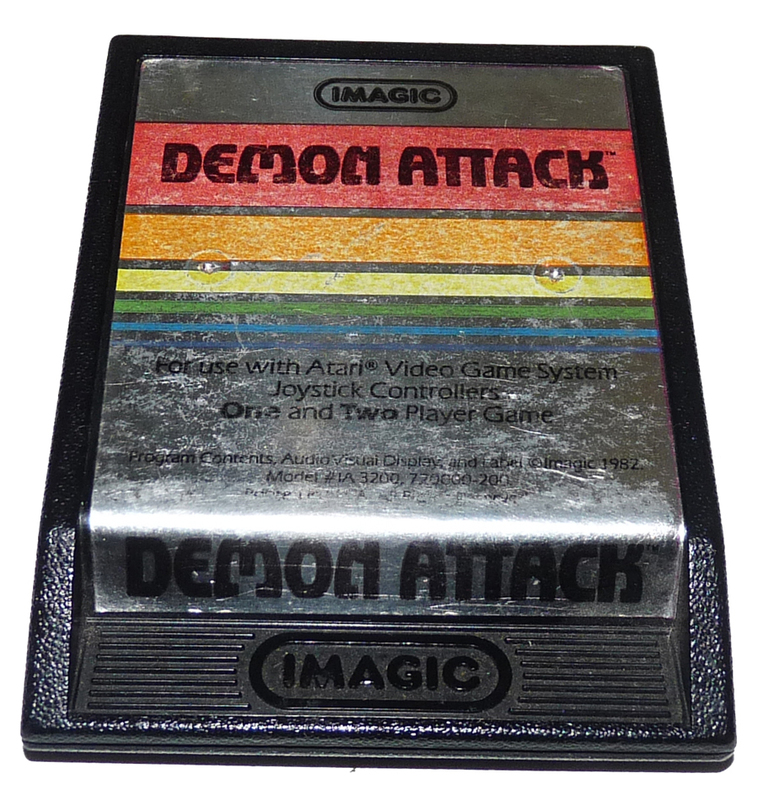 Most games will have the label facing up and the name of the game, on the top of the cart, would be facing you. So sitting on the floor you could read the game inserted. Above the cartridge slot in white is the name “video computer system™” (all in lowercase, so why do we not type it that way… whatever). Power – On (up) Off (down) – Red paint is used for these letter while yellow is used for the rest. TV Type – Color (up) B/W (down) – As mentioned above, initially used to adjust greys for B/W TVs. Left Difficulty – A (up) B (down) – This will often change some aspect of the game to make it easier. “A” is considered Advanced, and “B” is Beginner. Each game is different and these buttons could also be used for other functions in the game. Left is the player-one spot, or the port behind the lever. 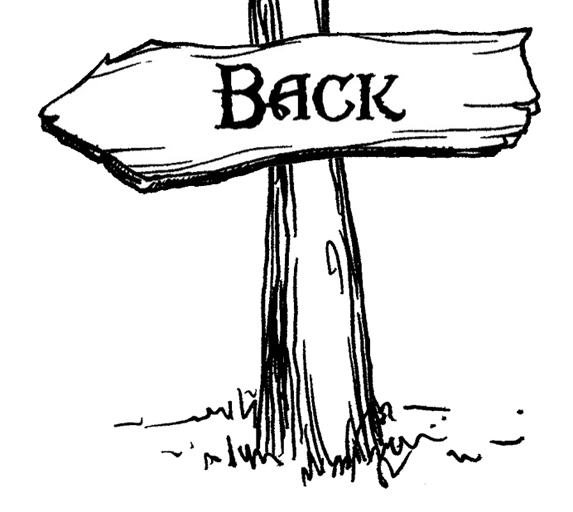 Right Difficulty – A (up) B (down) – Same as the left one, but for the right side, player-two. This would allow one player to play on a different difficulty setting. Game Select – This is a spring loaded lever that is always in the Up position. You can press it down and it will return to its original position. 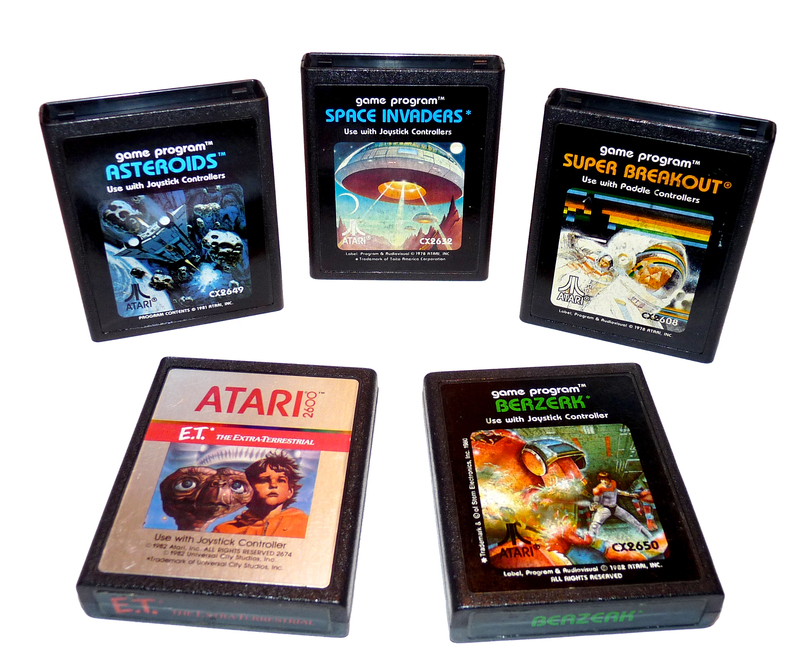 Many Atari games have several variations available within the game. The pack-in Combat is a great example. There are 27 different scenarios you can toggle through. 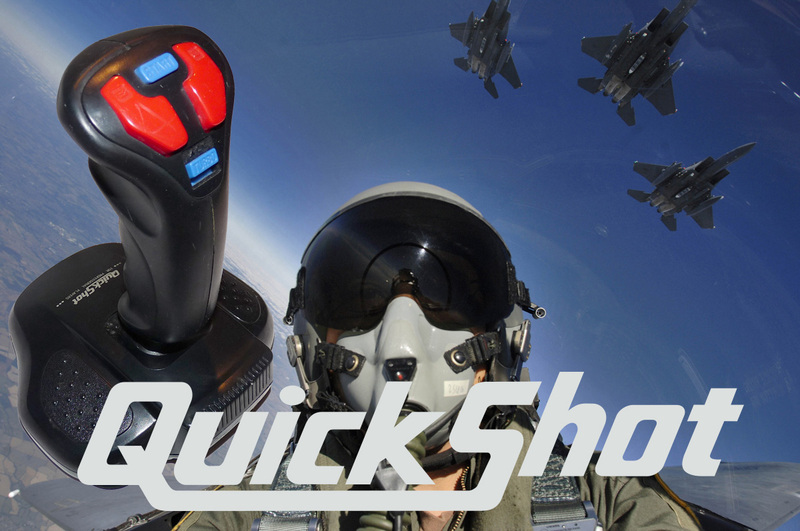 You can change the map, make the bullets ricochet, change the tanks to jets or bi-planes and other options. Game Reset – This switch is also spring loaded like the Game Select switch. It will often restart the game when depressed. On the back of the Atari VCS you have 3 ports and a cable. Starting from the left the first thing you will find is the AV cable is actually built-in to the Atari. This is a standard coaxial cable like the one feeding your modem or cable TV. This cable is very long (10-12ft) which allows you to place the console on the floor or coffee table in front of you (which is how it was done back in the day). Then we have the controller ports and AC Power port. Yup, this is odd by todays standards, but the controller ports on the back of the machine facing away from you. 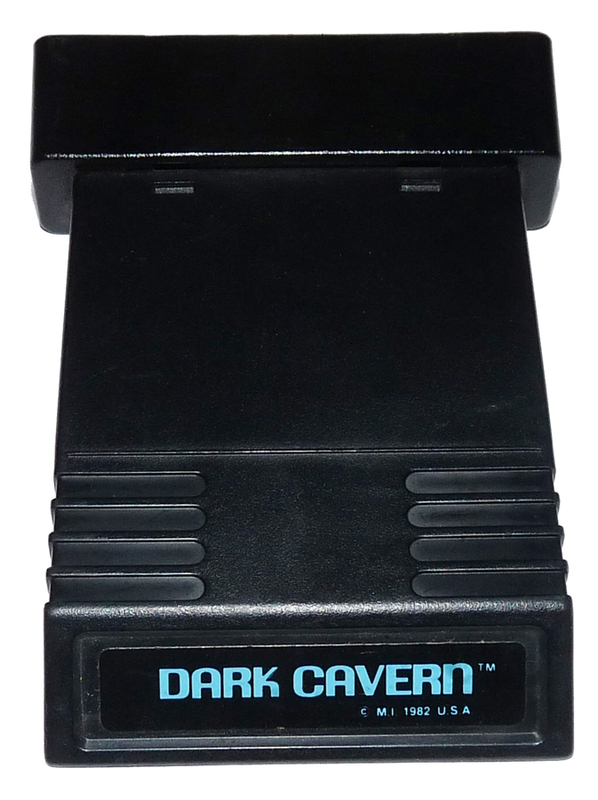 This is the same 9-pin port you can find on the ColecoVision, SEGA Master System and SEGA Genesis. The ports are labeled Left Controller and Right Controller, but are referenced based on looking at the machine from the front, so when you turn the machine aroudn and read it, left is on the right, and right is on the left… Between the controller ports is the AC port when you plug in your power adapter. 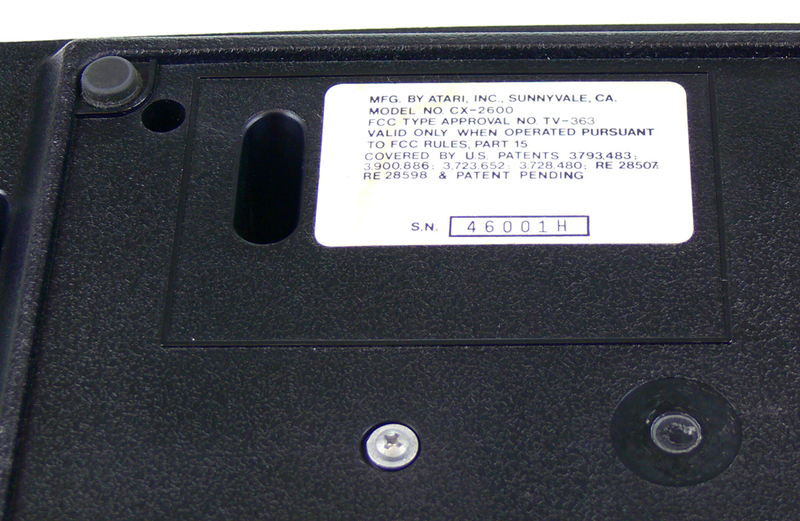 On the bottom of the Atari VCS, almost hidden on the left hand side, is a channel selector switch. This switch is marked A & B, which respectively selects channels 2 or 3 on your TV to display the game. I’ve read that some Heavy-Six units do not have a channel switch (mine does), but if yours does not, then it will always use channel 3 like the later versions of the Atari 2600 that did remove the switch. Also on the bottom of the unit you can find the manufacturing sticker with the seriel number, unless it’s gone. 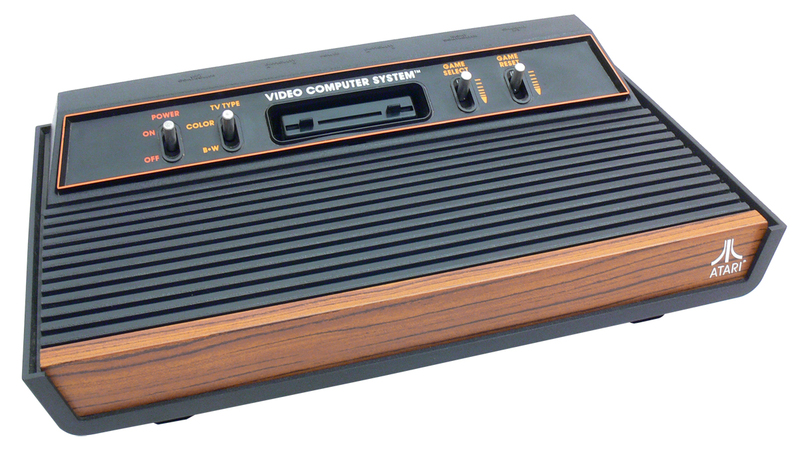 The original Atari VCS shipped with the Combat game cartridge and four controllers. 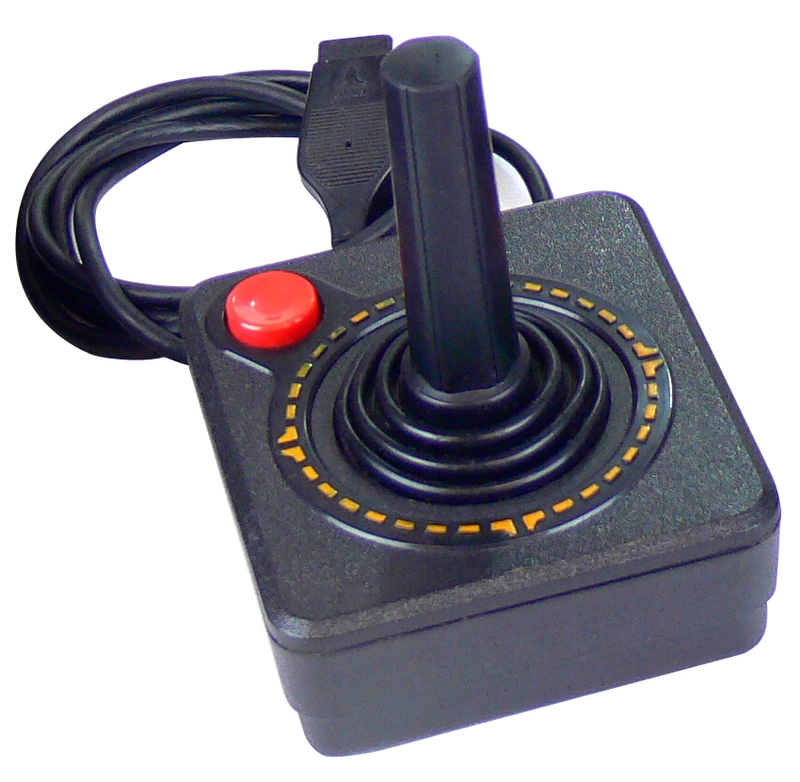 There were two standard one-button Atari Joysticks and the other two were Paddle controllers. The Atari VCS went on to have many revisions which I will cover below, but in all cases the Atari machines have held up very well for thier age. As I write this my Atari is over 40 years old, which is insane to think about, but I can promise you my smart phone and latest gaming systems, will not work 40 years from now. There is debate, but from everything I’ve seen, there is very little if any noticable audio or video differences between the machines. Durability is also even across the machines. The six lever switches were eventually replaced with a more moden switch and button, which are less likely to break, but that’s about it. This also applies to the Sears models. So any version of the Atari (or Sears) will do if you are looking to play some Atari 2600 games. This is the first revision made to the Atari VCS. Production was moved to Asia (my Light-Sixer was made in Taiwan) and away from Sunnyvale, CA. At first glance the machines look the same but there are some subtle but noticeable differences. First off the weight of the machine has been reduced, hence the term “Light”. This was mainly achived by reducing the thickness of the bottom plastic section of the machine. When compaired to the original heavy model, the trim, seen from the front, is noticably thinner and more squared off on the bottom corners. The easiest way to tell which model you have is to look on the bottom. If it was not manufactured in California, then it’s not a “heavy”. Other than the cosmetic changes this version functions exactly like the original. 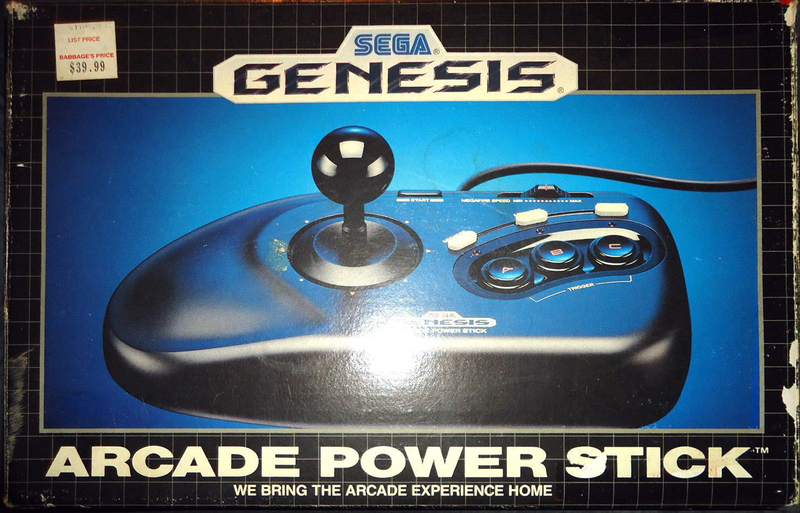 This version shipped with Combat and 2 stadard controllers, but not the paddle controllers. Back in the day Sears was, what todays Walmart is, the largest retail chain in the land. 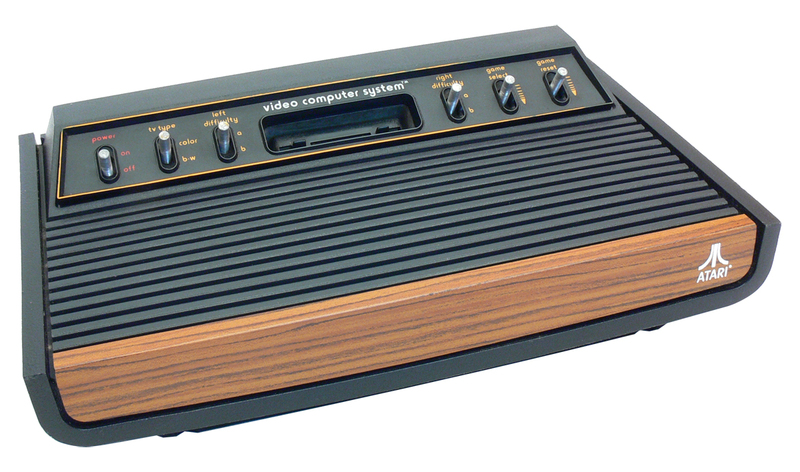 Atari had a licensing deal with Sears that allowed them to manufacture clones of the Atari VCS. 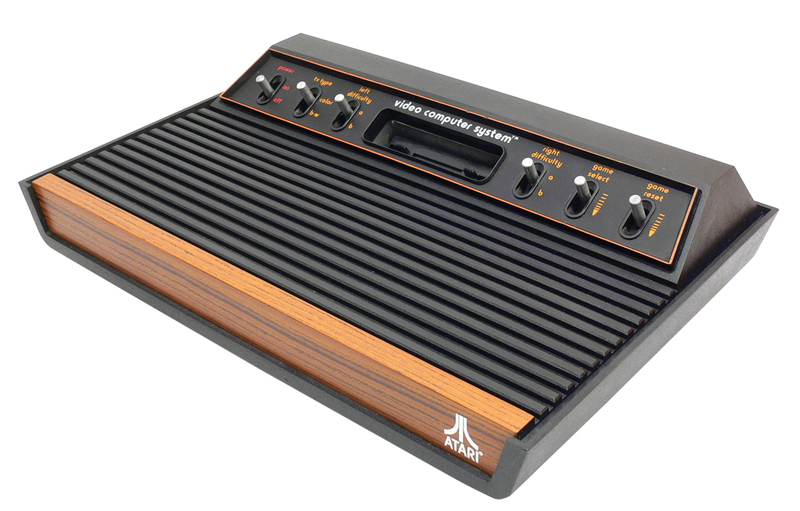 As such, pretty much every time Atari made a change to the VCS, Sears would also, so there are a lot of “2600” machines out there that don’t even say Atari. The Sears models are for the most part identical to their Atari counterparts. The big difference being they were called TELE-GAMES and had some slight color modifications. If you find one of these, they work and function just like any Atari branded version. This Atari VCS model is easy to recognize as it now only has four lever switches on the top/front of the system. The left and right Difficulty Switches along with the Channel switch, Controller ports and Power port, have been moved to the top half of the unit, on the backside of the control module. This does make the Channel Select switch and the controller ports easier to access, but the Difficulty switches a little harder, but not by much. Those switches have also been replaced with a more modern and smaller switch style. The names for the ports on the back are now molded into the top of the command module. 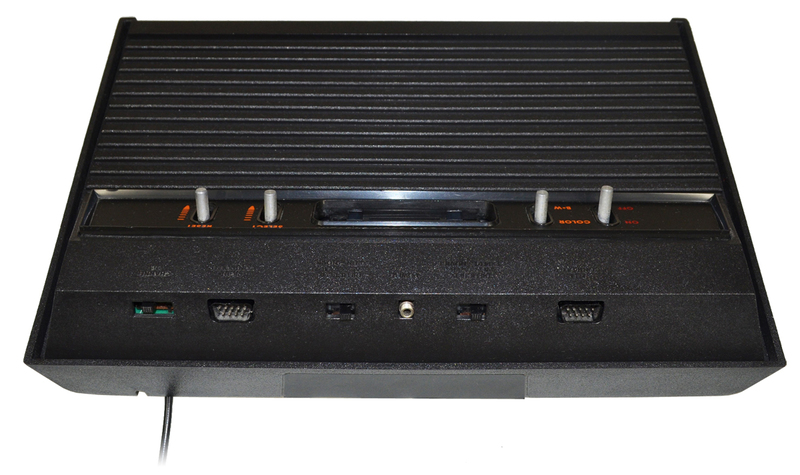 Other than moving the ports around, the case and color scheme are very similar if not identical to the “Light” version of the Atari VCS. This system also shipped with Combat and two controllers. 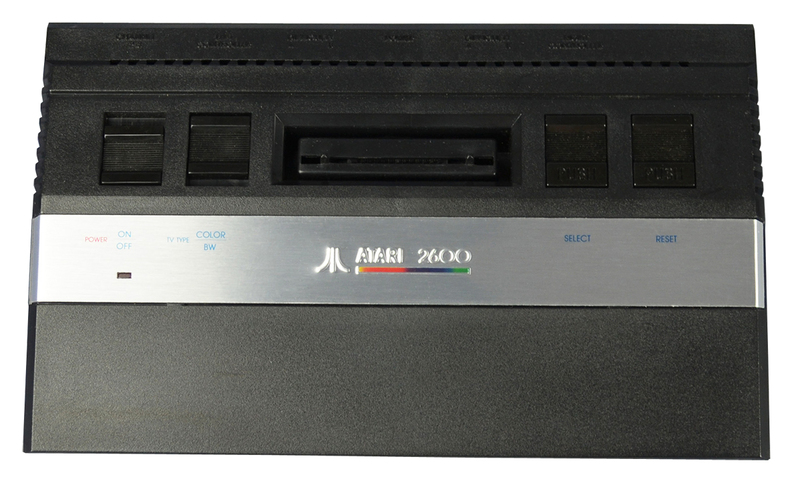 Here is the first Atari to be branded “2600”. 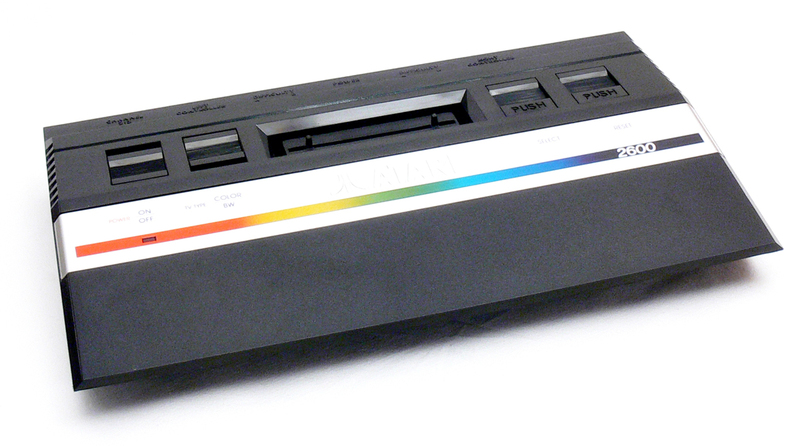 This version was released along with the new Atari 5200 and the name change helped create a standardized naming convention for the Atari line. This unit is often referred to as the “Darth Vader” model, and I’m sure you can tell why. 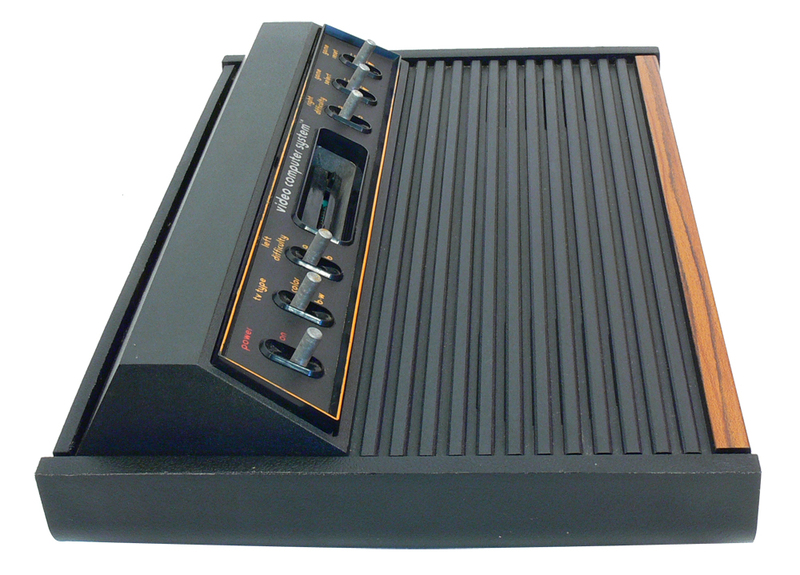 This Atari 2600 has the same layout, size and shape as the previous 4-Switch version, but has removed the wood grain frontend. 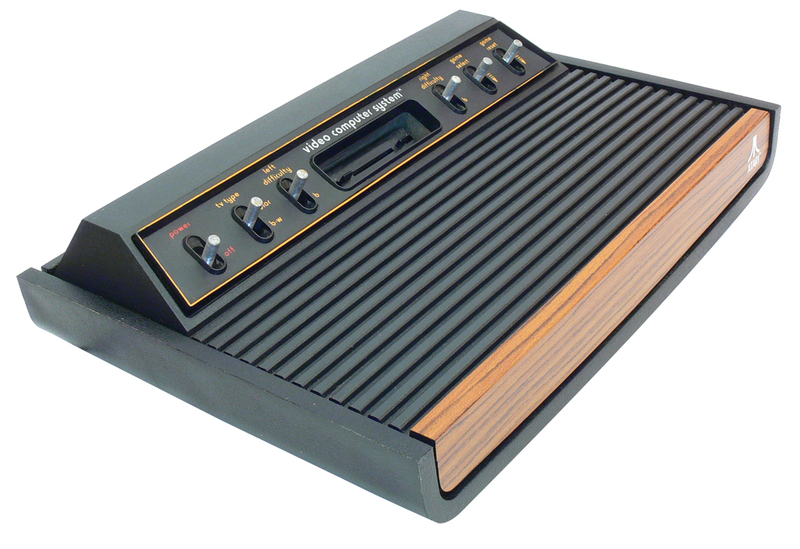 Instead we now get a full black console with the ATARI 2600 logo on the front left. 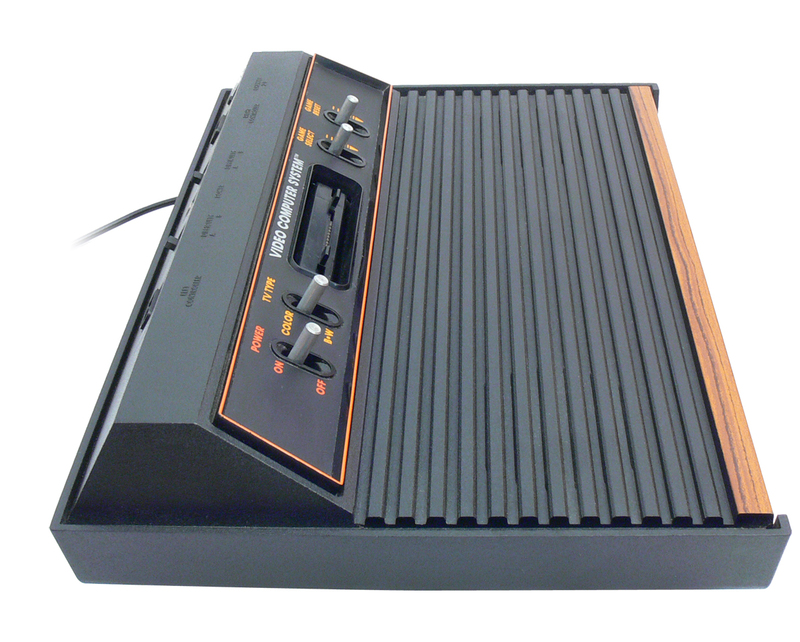 The Atari 2600 Jr. was the first major redesign of the Atari VCS. This sharp little guy appeared around the time of the Atari 7800 and matched it’s new slick style. It is simply referred to as “Junior”, that is not it’s official name, it’s just an Atari 2600. This model is much smaller than the systems the came before it, but all the same buttons and functions are still present. It functions exactly like it’s older brothers. The system remains black but now has a large silver plate running through the center. The Atari 2600 logo has a small rainbow bar underneath it. This version is called the “short rainbow” as another version would soon be released with a larger more prominent rainbow bar. The levers are now all gone and replaced with updated switch that sit flush with the case. 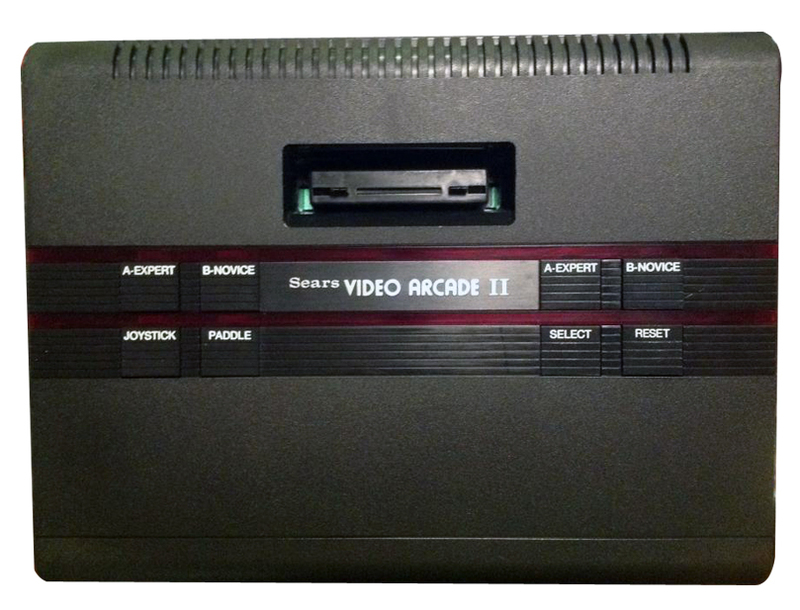 The same four options appear on the top of the system; Power (with an LED light), TV Type, Game Select, and Reset. The major change on the back of the unit is that the AV cable is no longer built into the system. An RCA port is now on the far left where the cable can be attached. For whatever reason Atari made a slight design change to the Atari 2600 Jr. shortly after it’s release. This version is all but identical externally except that the raimbow bar is larger and runs the full width of the system. Other than that, the port positions and functionality are exactly the same. You are looking at the original Atari 2600 joystick. This controller is as iconic at the system itself. 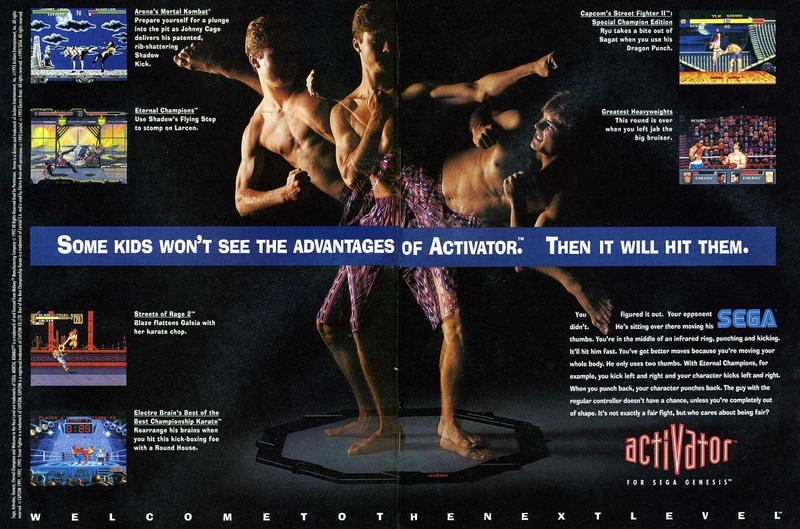 You have a fairly large 8-directional joystick with a rubber boot, and a single red button. That’s it, that’s all you get, that’s all you need. It’s not the most ergonomic of controllers, but it got the job done. Game developers had to creative in some circumstances, combining a directional position with a button press to activate some feature (Defender smart bomb for instance). There are several slight variations made over the years, but like the system itself, the controllers all functioned the same way, no additional buttons were ever added. 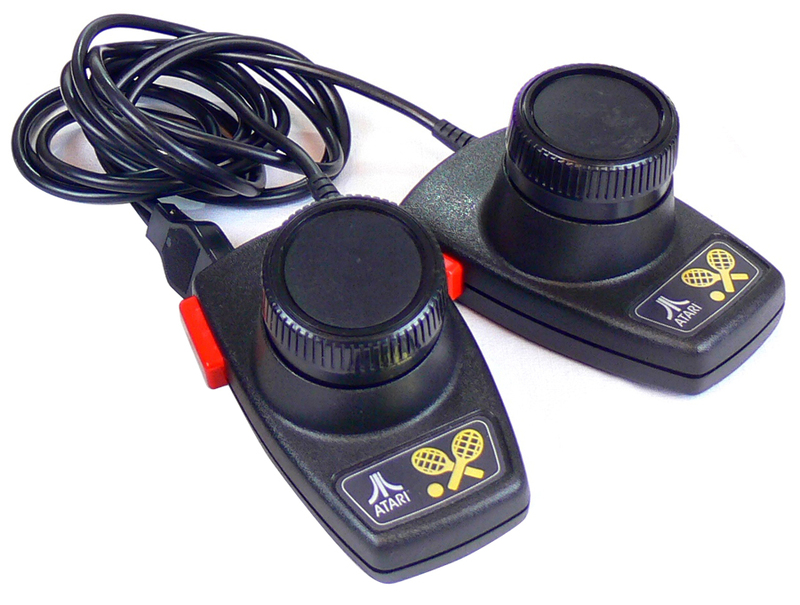 The Atari 2600 Paddle controller initially shipped with the Atari 2600 but was late removed and available separately. The paddle controller is a large dial, that can be turned left and right. It will rotate around 330°, stopping once turned to the limit in either direction. The button is located on the left side where your thumb would set, unless you’re left handed of course (freaks ;). There is also an image of two tennis rackets on the controller. This controller was used for games that played similar to Pong. Normally moving a “racket” up and down or side to side with very good precision. Game likes Breakout and Warlords are two perfect examples. This controller came as a pair with one plug. This meant that on some games you could plug two pairs in and 4 people could play. The Driving controller appears very similar to the Paddle controller but has one major difference. That large dial thats rotates left and right will continuously turn, it never hits a stop. This was used for, you guessed it, driving games. 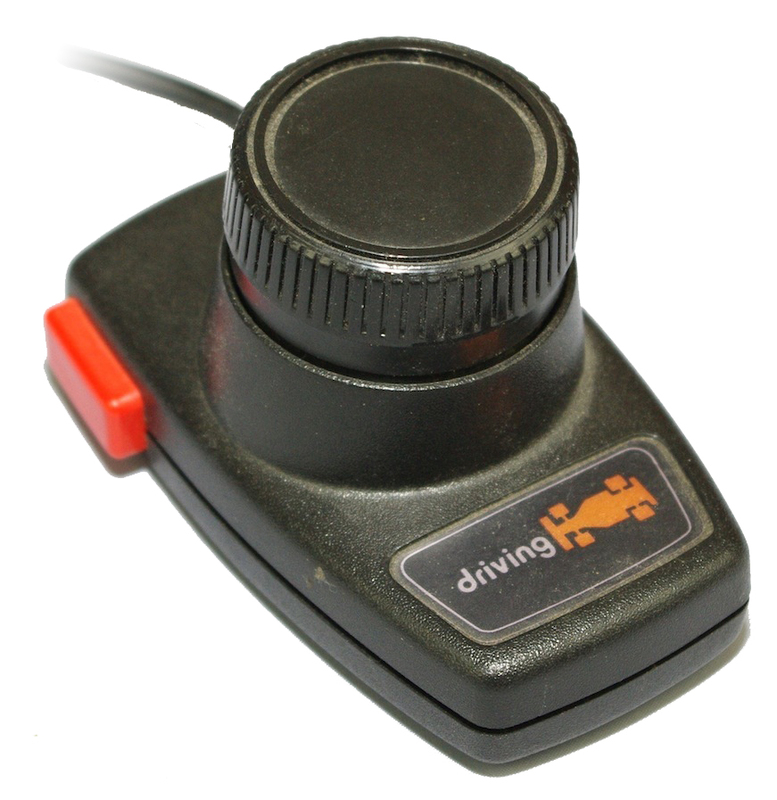 Unlike the Paddle controller that came as a pair tethered to one controller plug, the Driving controller was a single controller. And here you have the cartridge, that made cartidges cool. 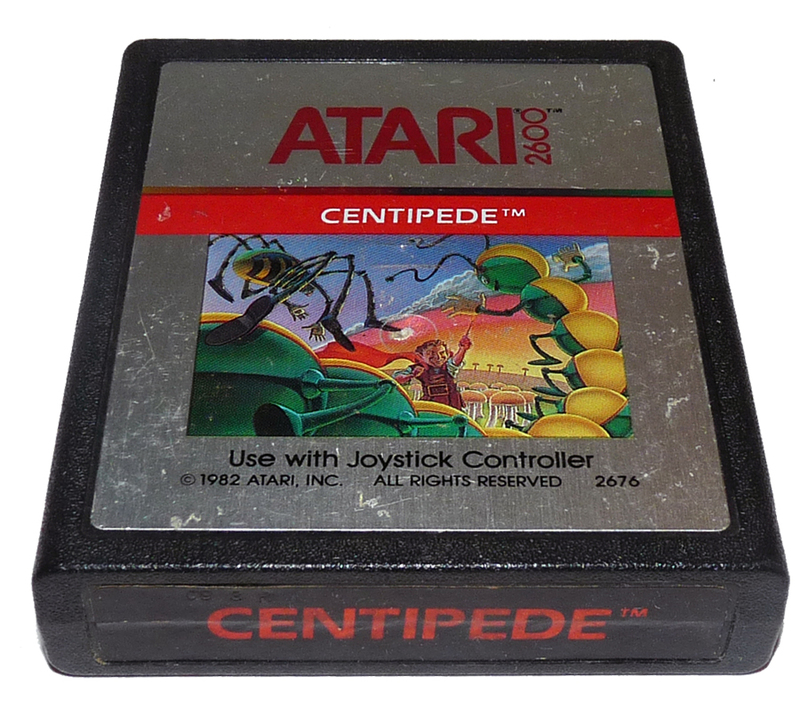 The Atari 2600 was the first major console that allowed you to change games by inserting a different cart. This was a game changer… huh! get it! I just came up with that right now! I’m leaving it it so good. Anyway… So began the era of game collections. 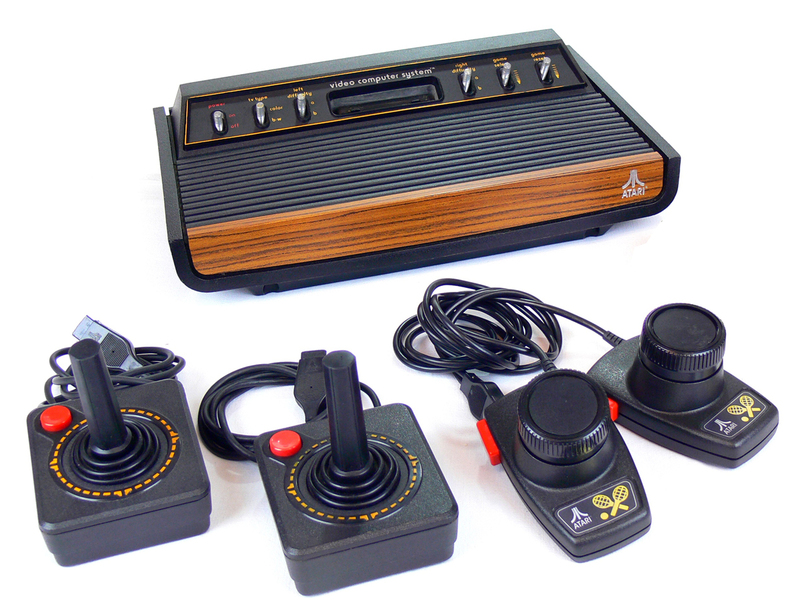 The Atari 2600 was the console to bring home the arcade games. As such many of those ports are some of it’s best titles. Space Invaders, Asteroids and Berzerk are just a few examples. There are also many great, classic first party Atari titles like Yar’s Revenge and Adventure. And then there are a slew of horrible games. Reguardless, with it’s huge library and ease of finding games, this is a great system to collect for. This being the earliest of the cartridge based consoles it also has the least amount of graphical power and can be a bit hard on the eyes. Many games struggle to even come close to their arcade counterpart, like Donkey Kong and Pac-man, and some are all but unrecognizable, like Zaxxon. But, amazing games for the time could be made like Pitfall II. The cartridges themselves are are about 3″ wide, 4″ tall and an inch thick. While there is a standard shape that was used most often, it seemed to be only a suggestion as there are many different shapes to be found. This can make it a bit confusing when finding on in a flea market, but if it’s not an Atari 2600 cart, then it’s a ColecoVision. I’ve also noticed that the labels on many carts are in rough shape. Not sticking or just worn out, time waits for no one. The games shipped in cardboard boxes. Being made in the 70’s and 80’s, good condition boxes are harder to find, but by no mean impossible. And just like the shape of the cartridges, the art style and look of the boxes is all over the place. Atari made games often used a standard look, but everyone else did what they wanted!